Good morning, dear Reader! 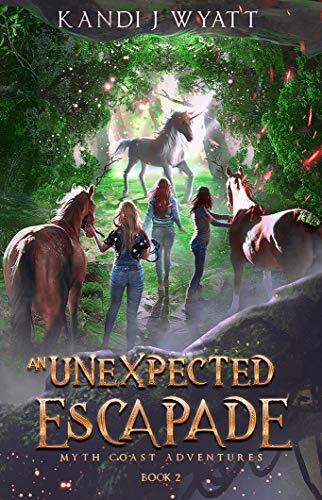 I have a special guest for you today, the young MC Daisy from Kandi Wyatt’s newest book: An Unexpected Escapade, book 2 of the Myth Coast adventures, releasing TODAY! I am so excited about these books, I have both this one and the first one on my kindle and I am looking forward to reading them both in the very near future. Kandi’s characters are always such a pleasure to have over for interviews. Protect friendship, family or a creature that’s not supposed to exist? Ana and Daisy have been friends since third grade, but a rift in the space-time continuum in their little town may change that. When a unicorn waltzes into the pasture with Daisy’s appaloosas, a poacher, who will stop at nothing to gain the unicorn horn and its healing tears, shows up. Daisy is focused on saving the unicorn while Ana’s parents face sudden life-threatening health issues. When Ana learns about the healing tears, she’s forced to choose between friendship and her family’s health. Can the girls find the grace to compromise and save Ana’s parents and the unicorn? I enter the stables, glancing around, breathing in the familiar scent of horses and hay. Before I can truly get my bearings, however, a young girl appears in front of me, wielding a pitchfork, a wary expression on her face. Her dark hair is pulled back into a pony-tail, and she is quite a bit shorter than me, but there is a fiercely protective look in her eyes. Daisy relaxes a little, but still is wary. As she leans against the pitchfork, she says, “I- I g- guess, it wouldn’t h- hurt to talk with you. M- my name’s Daisy, and I- I’m in the eighth grade.” She swallows. Daisy leads me to the furthest stall where a pearlescent horn reflects the barn lights. The wonderful creature rises to her feet while Daisy murmurs to her without a trace of her stutter. Hello. A voice echoes in my mind. Thank you for helping take Daisy’s mind away from her problems for a while. I appreciate it. I reach out tentatively and stroke the unicorn’s neck. A thrill courses through me and I think again how being a reporter for the InterFiction Gazette is just about the most wonderful job I could ever have asked for. My badge begins to glow and I wrinkle my nose in frustration. These visits are always far too short. I am going to have to get a copy of the book so I can stay longer. As the barn and stall fade around me, the last thing I see is Daisy, her head leaning against the unicorn’s neck, her dark head contrasting with the shining white face of the majestic creature. Even as a young girl, author Kandi J Wyatt, had a knack for words. She loved to read them, even if it was on a shampoo bottle! By high school Kandi had learned to put words together on paper to create stories for those she loved. Nowadays, she writes for her kids, whether that’s her own five or the hundreds of students she’s been lucky to teach. When Kandi’s not spinning words to create stories, she’s using them to teach students about Spanish, life, and leadership. Thank you so much for sharing. It’s always a pleasure to be featured.